Dr. Hansen, thank you for agreeing to do this blog-aview. Thank you for the invitation, Joel–I’m honored. And you can call me Gary. I tell my students that the only time they have to call me Dr. Hansen is when they are asking for an extension on a paper. What was the inspiration for this book? I listened carefully and discovered that many many Christians have prayer lives that are far short of what they want them to be; or what they need to be for growth and health. Prayer is the rock bottom essential of the Christian life–Calvin calls it “the chief work of faith” and for him that is saying a lot. But most people only know one approach to prayer, whether they came up with it on their own or learned it from their pastor. If that falls flat they may give up. Some conclude they just are not “the praying type”. Others conclude Christianity is the problem; they move over to “spiritual but not religious” and start looking elsewhere for something to feed their souls. Since I was a high school student I’ve been reading what historians call “primary sources,” aka “old books by dead people.” I read the greats of the past to find mentors and wisdom for my spiritual life, and along the way I found a wide range of approaches to prayer. It struck me that more people need to know the many authentically Christian ways of praying that are out there. And I noticed that a great many books on prayer answer every question except “How do I do it?” I thought it could be really useful to introduce prayer through practice rather than through theology. Some people sit with their best friend in a café and talk talk talk, pouring out every detail in words, and the relationship deepens. Some people sit with their best friend in a boat and fish fish fish, never saying a word, and the relationship deepens. The cafe people and the fishing boat people are going to relate to God differently–and I wrote Kneeling with Giants to help them find ways of prayer that can take them deeper than they have gone before. You have a lot of different, shall we say, types of people in this book. You go from St. Benedict to Calvin to the Puritans to Andrew Murray. First, is there a favorite of these? Second, what do think is the constant theme in each of these Christian lives? It is very hard to pick from the ten who make up the chapters of the book. I love all my children the most–I just love each of them differently. That said, St. Benedict looms large for me. Of course there is very little written by Benedict to draw on: just his Rule, and quotations in Gregory the Great’s biography from a good bit later. But praying the way Benedict taught is wonderful preparation for all the others. Not all my readers like the fact that I put the Benedict chapter first, but this is why I did. Rather than starting with something readers would find easy or familiar I started with one that would be a good foundation to build on. As to themes held in common I would say that all the people in the book share a conviction that prayer is supremely important to authentic Christian life and discipleship. One can find a number of things linking various figures in the book, including use of the Lord’s Prayer or the Psalms, honest self-examination, or the contemplative gaze. But they all had prayer as a key aspect of their identity as disciples, and a crucial way of framing their vocation. I am greatly interested in The Cloud of Unknowing. It is one of those books that warms the soul to Christian mysticism. Why did you include this work and have you had any other feedback about it? I included The Cloud of Unknowing for a couple reasons. First, I love the book. So much of what one hears today about prayer has to do with feelings–many are convinced that if God is present we will know it by our senses, and many assume that having lots of groovy feelings while praying is progress or maturity. The anonymous 14th-century author of The Cloud says no: Your feelings are part of creation, and God is not part of creation. Anything you can feel with your senses is not really God. This is excellent news for those of us who pray a lot and feel absolutely nothing in return. For the author of The Cloud, feeling nothing is exactly right. That is right where you should stay, with your full attention on the God who is beyond your senses, your words, and your imagination. Second, it perfectly fits the profile of topics I set up for the book. To be included as one of my “giants” one had to either explicitly teach or prominently practice a distinctive way of praying. The Cloud of Unknowing teaches a form of contemplative prayer, and does so simply and directly. The word “contemplative” gets thrown around pretty loosely today, but The Cloud’s way of praying is just about the definition. Contemplation is about looking, turning the gaze of the heart and soul toward God, and that is what prayer comes down to here. No words, no pictures, just gazing at a God who can’t be seen — thus the cloud image. And for both of these reasons I think it can be really helpful to people who might otherwise never hear about it. You also asked about feedback I’d had on this. Only a little from readers so far, though one who was not drawn to this way of praying thought I did a good job of presenting it winsomely. I have lots of feedback from teaching this material though, and I know it is one of the hardest approaches for people to wrap their minds around. Still, though many stumble on it, The Cloud of Unknowing is life-changing for others. What do you commonly pray about? Some of the prayer practices that have shaped me most push me toward an openness and breadth in prayer that I think is healthy. One is The Practice of the Presence of God by Brother Lawrence, a 17th-century Carmelite. A Young Life leader introduced me to it when I was a teenager. Brother Lawrence’s way of praying started with a radical commitment to be aware that he was in the presence of God, and this led to prayer as a constant conversation with God about every detail of living. Another is the “Divine Office,” the cycle of prayer services as practiced in Benedictine monasticism and simplified in the Anglican tradition in the Book of Common Prayer. When I pray Morning Prayer, as was my habit for years, the service takes me through a whole range of practices and topics. Instead of sticking to my pet peeves and ruts, I am forced to confess my sins, hear the Good News of forgiveness, praise and lament with the Psalms, and intercede for others. I don’t pray for everything well, but I am grateful for ways of prayer that help me to bring everything into the conversation. You are a professor, correct? What are your classes like when it gets to this subject? I teach at the University of Dubuque Theological Seminary and offer a two-semester course on the ways of prayer I present in the book. What are these classes like? For me they are FANTASTIC! I went into theological education hoping to journey with students as they grow in Christ and prepare for ministry, and that is absolutely what happens in my prayer class. It is a great privilege–prayer is a very intimate thing, and here is a group of ten or twenty people sharing openly about what they experience in prayer, how they are growing in prayer, and how they will bring classic approaches to prayer into their ministry. Does prayer change as we get older? Should it? I hope so. As I get older I’ve been relating to God longer, so the relationship and the conversation should be growing richer. I am not sure whether certain practices of prayer are better suited to different ages. My attention has been more focused on how people of different personalities are drawn to different ways of praying. I can certainly say, though, that prayer can change according to the season of life one is in. When I got married the ways I prayed and the topics I needed to pray about shifted–not completely, but noticeably. When our children were born both of our prayer lives changed. I had far less ability to include the Daily Office in my routine, but surprisingly my wife began to pray the Office more than before–she found the iBreviary app for her iPod, and she could pray it when she was nursing. The key is to have a broad enough knowledge of what authentic Christian prayer can be. That way when your life changes, and you can’t pray the old way, there are new ways there waiting for you. You deal a lot with the Mystics in this book, or those so inclined. Any chance of a future book devoted just to Christian mysticism? Protestants in particular need to know more about mysticism, but it is an uphill battle since prominent voices have written it off as unhelpful or even non-Christian. Mysticism is the direct encounter of the human being with the living God; Anyone who tells you Christianity is a relationship with God while denying the validity of mysticism misunderstands one or the other. Kneeling with Giants includes some prominent mystics, such as Teresa of Ávila and The Cloud of Unknowing. But of Teresa’s three major works I chose the least mystical because I wanted to emphasize her teaching on one particular practice of prayer, what she calls “recollection.” But any form of prayer taken seriously and in depth is aimed at bringing you close to God, and that can lead to encounters that will best be described as mystical. I read a good many mystics, but most were not a good fit for the book. That is, though they describe rich encounters with God, or teach things that result from those encounters, not many teach distinctive ways of praying. To take just one example, Hildegard of Bingen is a very popular mystic. (Also nearly impenetrable, but that’s another topic.) She was a Benedictine, an Abbess. One has to assume that one of her main ways of praying was the Divine Office. The distinctive part comes in that her visions apparently came in the midst of migraine headaches. That is not a method easy, or desirable, to emulate. What are some of the struggles students have when they first really learn how to pray? Even when people are introduced to an approach to prayer that seems to be just right for them, they still face all the ordinary struggles. They have to figure out how to make it a regular part of their day. They have to get past their wandering thoughts and distractions. They have to keep at it despite the fact that something else always feels like more fun. They have to bring their whole selves to the task rather than letting it be something they do without really showing up. And they need to exercise the compassion with themselves that they would show to someone they really liked–it is not always going to go smoothly, and they have to be patient. I should take a page from Jesus’ playbook and answer your question with a question: Is marriage natural? Just like wanting to be married, wanting to pray is natural. Just like growing a good marriage, being able to pray takes a great deal of effort. As Augustine tells us, we are made for God and our hearts are restless until we rest in him. At the core of our being we need to pray, and on a daily basis we are in need of what only God has to offer–so we call out in prayer. But here we are, with hearts and minds damaged by sin, and our lives shaped by a culture that doesn’t value prayer or make room for it. We find ourselves not knowing how to start or what to say. Or we find ourselves drawn to check Facebook and Twitter whenever we try to sit down to pray. Or the demands of family and work exhaust us so that if a quiet moment presents itself we fall asleep. And when we do start a serious practice of prayer, being in the presence of God sometimes shines a bright light on all the stuff in our lives that we have been trying so hard to push into the shadows. In a sense prayer is as simple, as elemental, as Anne Lamott’s “Help!” “Thanks!” and “Wow!” But growing in prayer takes ongoing effort. Just like in marriage, you have to keep showing up, finding the habits and structures that help, finding ways to grow close, be open, listen–and you have to keep at it during the times when it is painful and boring, as well as when it is fun. As a Wesleyan, and really a not-Calvinist, I have to say that I really enjoyed your section on Calvin. This really opens up a different angle on viewing the Reformer — one that is a bit more pastoral. Do you find that, when you look at people — their lives, writings, etc. — that your view changes if you find that at the very heart of the person is a life of prayer? Yes, looking to a theologian’s practice of prayer or writings on prayer is a great way to find out that he or she is really human. This would be the case with Ambrose, Anselm, and Aquinas–just to take “Theologians beginning with A” for our category. On the other hand, while poking into the history of the person’s life and character through their writings is always illuminating, it is not always edifying. Many are the cases of important figures in the history of the Church who were wise and influential but who were also more fun to read than to have dinner with. Often, though, where unpleasant or unscrupulous things turn up one also sees virtue–courage is a virtue, and one that is needed in ministry today. But acting courageously often leads to looking arrogant or stepping on some toes. Even seeing the unhappy and all-too-human parts of the story can be encouraging, since it reminds us that God has always used genuine, and therefore flawed, people. Actually many people’s views of Calvin improve the more of his actual writings they read. He has received a very bad rap. Reading his theology in the Institutes, can be a great experience. Many Christians find him a kindred spirit when they see that his aim is to articulate the coherent consistent message of the whole of Scripture, topic by topic. He does not impose a system, and he is not trained as an academic theologian. This shows best if one starts with the recently translated 1541 French edition (mid-career and adapted slightly to a lay readership) rather than the more commonly known 1559 edition. Any preacher would benefit from reading Calvin’s biblical commentaries, since he always focuses on the questions of theology and discipleship rather than straining out gnats and swallowing camels. Dr. Hansen, one last question before we go. What is your prayer? My prayer is that God would use Kneeling with Giants to help many, many people take prayer far more seriously than they ever have before. I long for people to stop thinking of prayer as something optional, part of their “devotional life” as if that were separate from their real daily living as people who follow Christ. I long for people to see prayer as the area they have to invest in so that they can become the people God intends them to be–ready to join what God is doing in the world. Please feel free to include any final thoughts here you would want the readers to know about you, the book, and a life of prayer. When I’m not teaching in our residential and (fully accredited) distance M.Div. and Master of Arts in Missional Christianity programs you will find me enjoying my wife and kids. On the weekend we’re probably stocking up on local produce at the Dubuque Farmer’s Market and cooking it up for friends. I have a soon-to-be-reactivated blog (www.withgiants.com) where I explore the riches of the past for the sake of being wise in the present and future of the Church. I also am taking baby steps with Facebook (Gary Neal Hansen) and Twitter (@garynealhansen). I always prefer to meet people face to face, and love to speak at churches, conferences, and retreats. Thanks for asking as you did about “…the book, and a life of prayer.” That is what it is all about–investing our lives in prayer so prayer becomes as unconsciously important as breathing. If you lead a small group or adult class, make sure you check out the two appendices in Kneeling with Giants where you will find resources for studying and praying through all or parts of it with others. And if you really want to study these ways of praying, buy the e-book version (available through Amazon, IVP, and elsewhere) because it includes a free companion volume, The Kneeling with Giants Reader: Writings on Prayer by History’s Best Teachers. 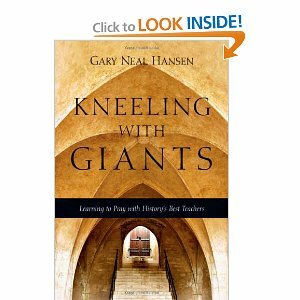 There is a full chapter of primary source material to accompany each chapter of Kneeling with Giants. Oh, and Kneeling with Giants makes an outstanding Christmas gift. Your uncle would love it. So would your cousin. Thank you Joel! You know, you have the best byline on your blog with that Lord of the Rings riff, “One blog to rule them all…” Always makes me smile. Next Can T. Michael Law convert Little Honey Tee Tee?